I’ve been in Vietnam for three weeks studying. I arrived back in Australia a few days before the new school year and hit the ground running! During extremely busy patches like this, I take short cuts where I can to make things easier at home. During January, I often do extra baking and freeze items to use during the first month of school, however this year has been different, so I am relying more onconvenient options – but I still want there to be a good balance between fresh and pre-made food. 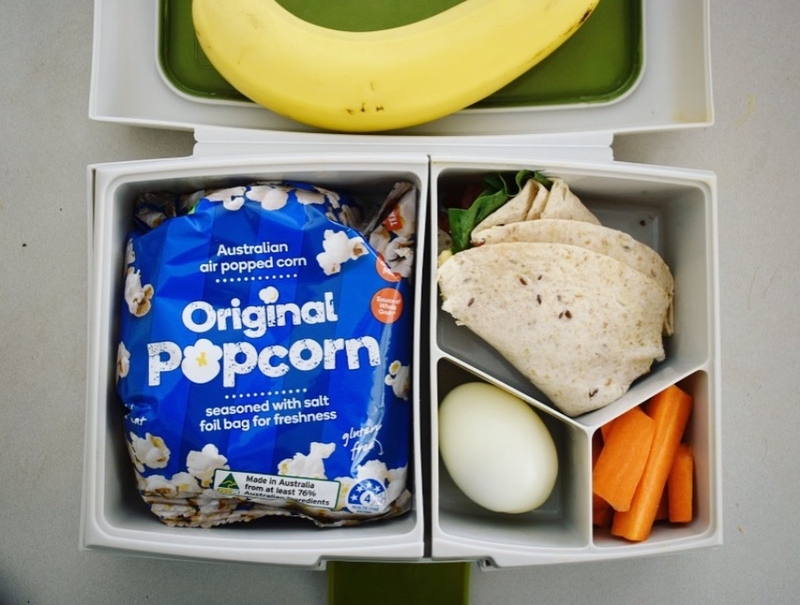 I enjoy creating content for my favourite supermarket, Woolworths, and this time, I am sharing tips for managing lunch box food during those really busy periods. This is where I am right now, so I am sharing my grocery shopping list for this week, the possible lunch box options and tips for making it quick. I still have a system for food which I explained in another post I wrote for Woolies here. When things are busy at home, I experiment and bake less and instead fall back on the types of food I know work well with minimal preparation. I’ll provide examples of the food I bought at Woolies for the first week back at school. I thought it would be interesting to see how much I was spending on food during these busy times when I do rely more on convenient options. Breakfast, lunch and snacks (morning and afternoon tea) added up to approximately $5 per child, per day. Happy with that! I have tried a lot of vegetables in the lunch box over the years, and have found that particular varieties are super easy. This week, I purchased cherry/grape tomatoes, carrots, mini cucumbers and snow peas. On the weekend, I simply washed the vegetables and cut the carrot into sticks before putting it all in a container in the fridge. 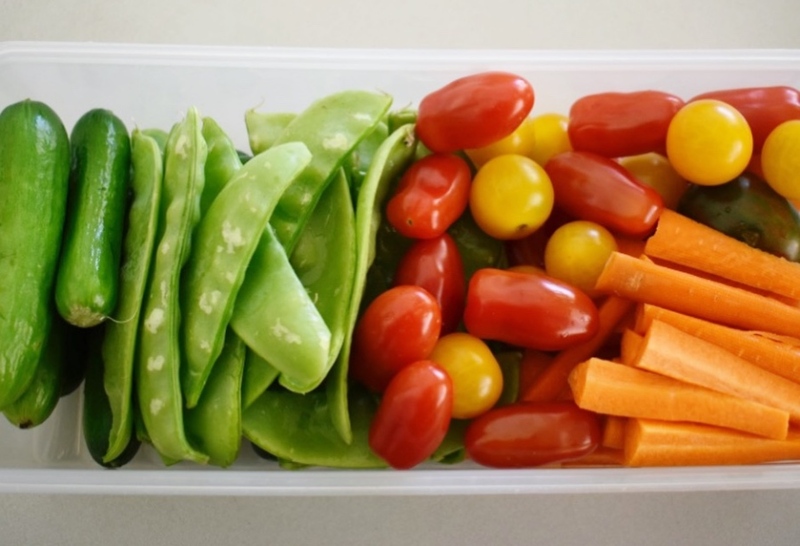 This means it’s easy to grab some veggies on a school morning to put in the lunch box. Again, during the busy periods, I look for fruit I don’t have to cut up. My kids love apples, but they don’t usually fit in the lunch box so I cut them up and put a drizzle of lemon juice on them to keep them from browning. 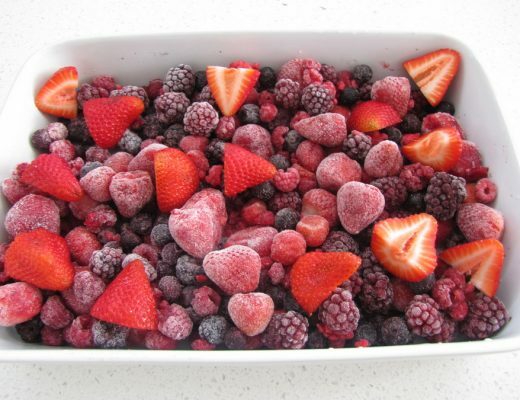 Instead, this week I have opted for fruit that needs minimal prep. 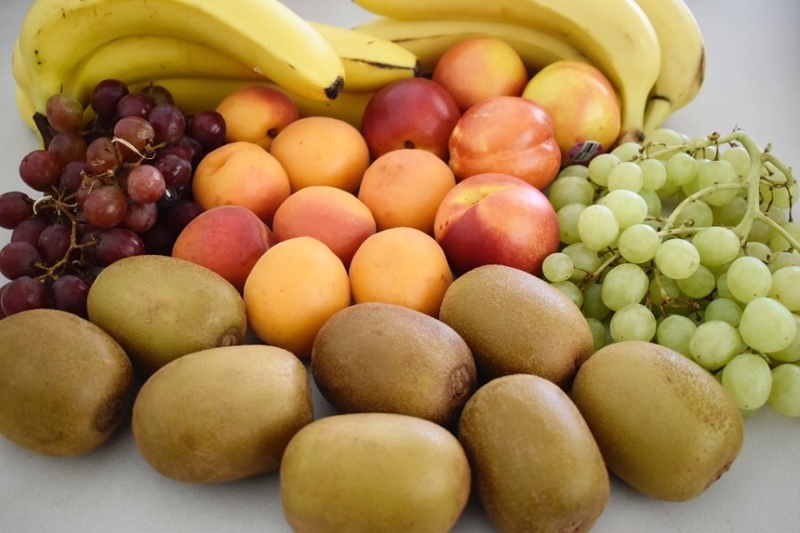 Examples are grapes, strawberries, blueberries, bananas, kiwifruit, apricots and nectarines. Check out the Odd Bunch range in-store too, because often the fruit is small enough to fit in the lunch box. This week, I found apricots in the Odd Bunch range section. Score. Snacks are where I need the most help with during the busy times! Look for the Woolies green seal for staple products like popcorn and pretzels to keep costs down. Depending on your needs, the ranges come in both serving size packs or singular. For example, you can get a 10 pack of popcorn or a single packet. It’s good to recycle the soft plastic in the bins that are available in every Woolies store. I recently purchased the Macro range of lentil bites (Beetroot & Pumpkin) and they were a hit with my kids. 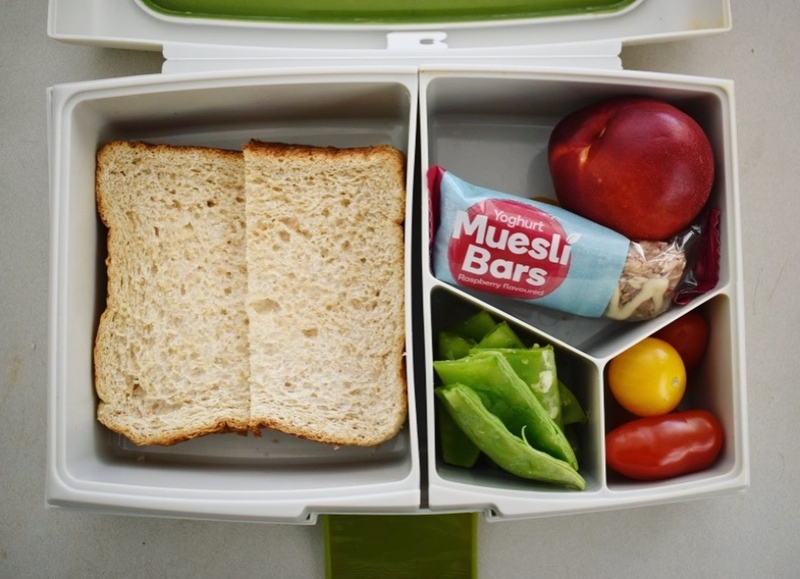 Muesli bars and tin fruit are handy for those busy times too. The product I rely on the most are the mini muffins from the bakery section. I pop them straight in the freezer, and then of a school morning, place the muffin directly in the lunch box frozen – they will be thawed by eating time. Another tip: if you have a pack of scrolls or buns, separate them before putting them in the freezer and it will make it easy to take out what you need. 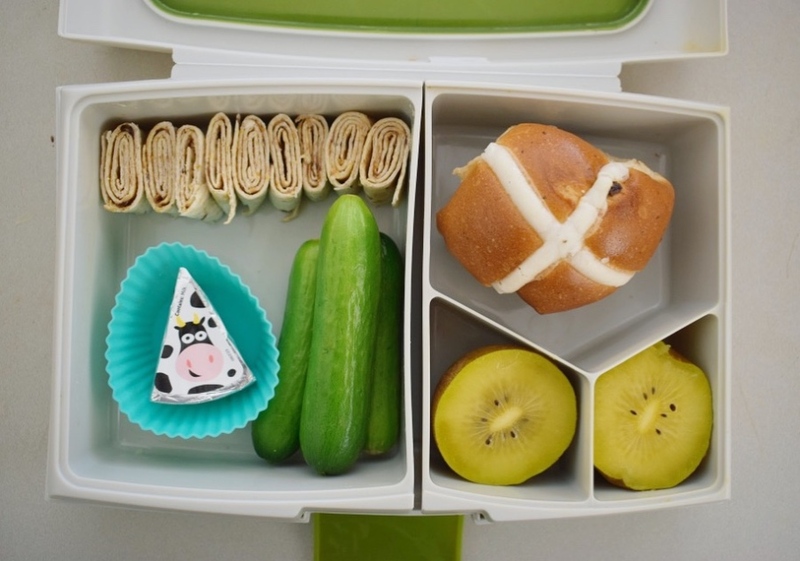 This week, I did this with hot cross buns, which work well in the lunch box. I fall back on sandwiches, wraps and scrolls during busy times. Favourite fillings here are a cheese slice, ham and spinach. Just slap it together and it is done. 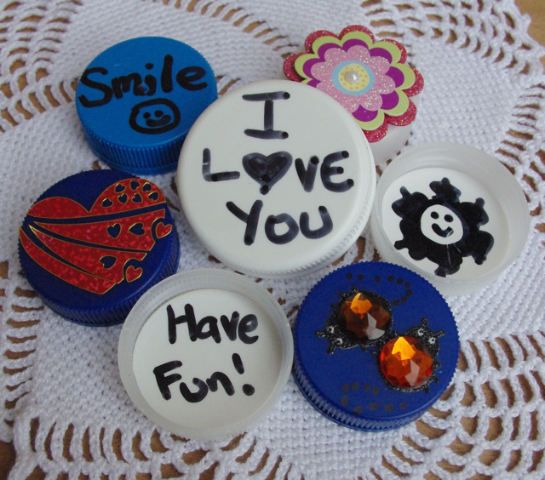 I keep scrolls in the freezer and pop them directly in the lunch box of a morning. If you want to make your own scrolls, I have a recipe here – but during busy times, I buy them pre-made. If you do want to mix up the lunch options a bit, my kids enjoy it when I make bread swirls out of wraps. 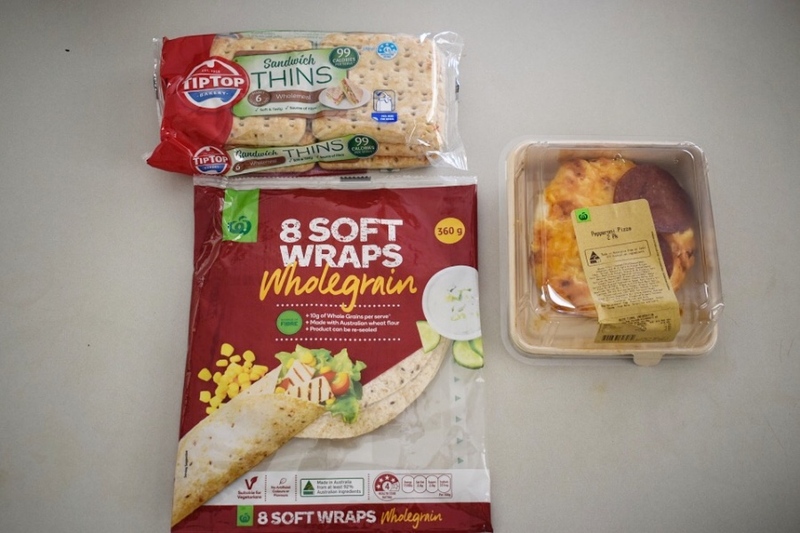 Simply smear their favourite spread over the wrap, roll it up and cut into bite sizes. 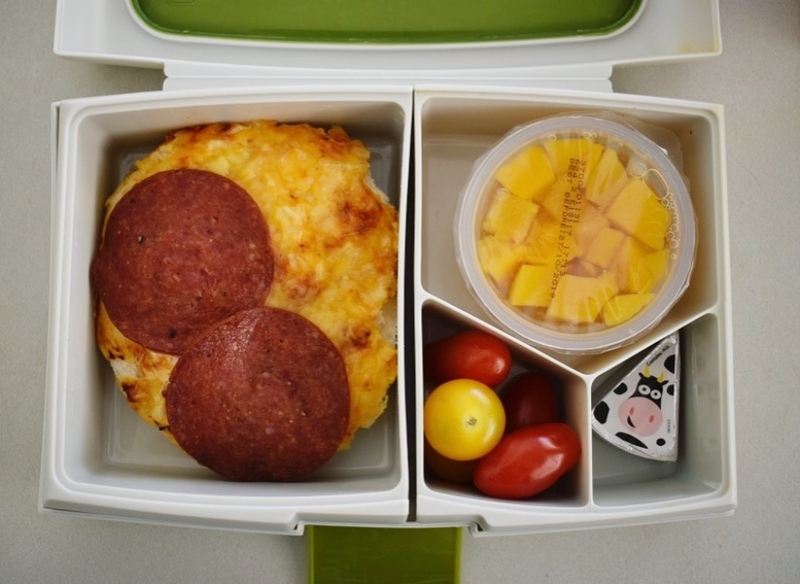 My children love cheese triangles, and they are a quick and easy option for the lunch box. If your children likes egg, hard-boiled eggs will keep in the fridge for a week. I boil them and keep them in their shells in the fridge until they are ready for use. Of a school morning, it’s a simple matter or pulling it all together. 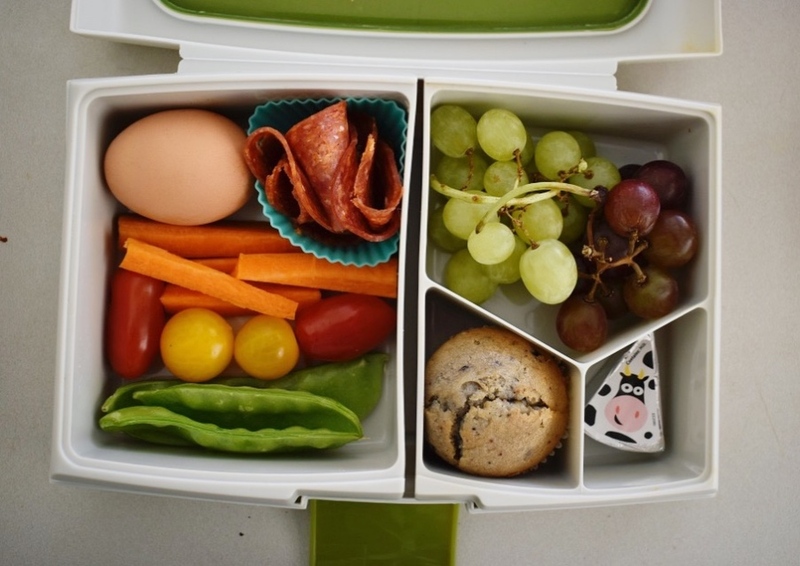 Tip: if you have a child who is not keen on sandwiches, a hard boiled egg and meat works well for lunch. Either peel the egg ready or to keep it extra fresh, place it in the lunch box with the shell intact and they can peel when it is time for eating. Tip: Any spread works on the bread bites. Tip: Sandwiches with a variety of toppings can be made ahead of time and frozen. For example, vegemite & cheese, jam, ham & cheese. Tip: Look for scrolls when they are on special and pop them in the freezer. Tip: Boil a batch of eggs on the weekend and they will keep a week in the fridge. Good for making egg & lettuce sandwiches or to eat whole. I’ve been following you for years and really like your content – but the information you (abs Woolworths) provide to your readers is incorrect and not evidence-based nutritional advice. Children should not eat low fat anything! Low fat products are usually supplemented with increased sugar, and it’s the high sugar & carbohydrate intake that is causing 2 out of 3 children to be overweight or obese. Thanks Mira. 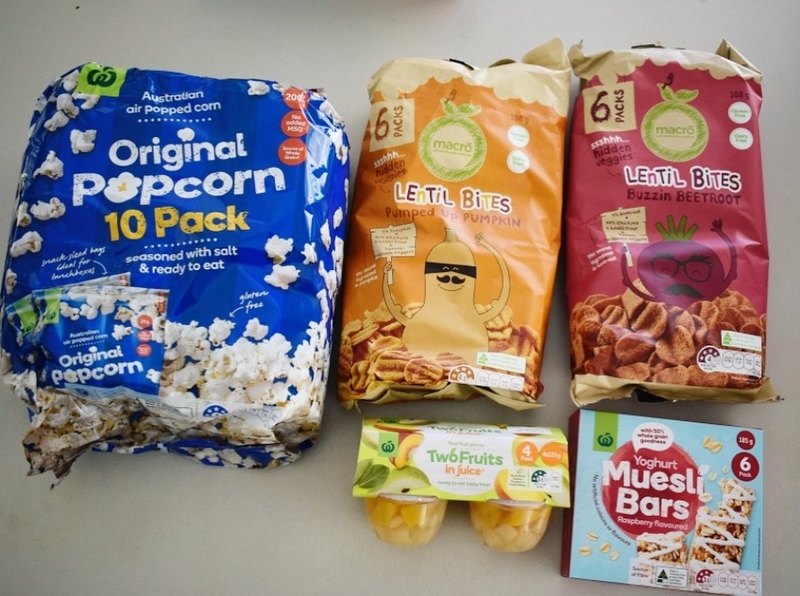 Really appreciate your feedback, and would love to hear more about your low-sugar snack ideas. 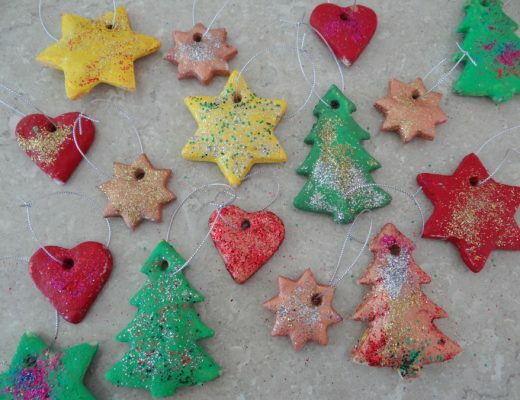 Always happy to give things a go with my kids. 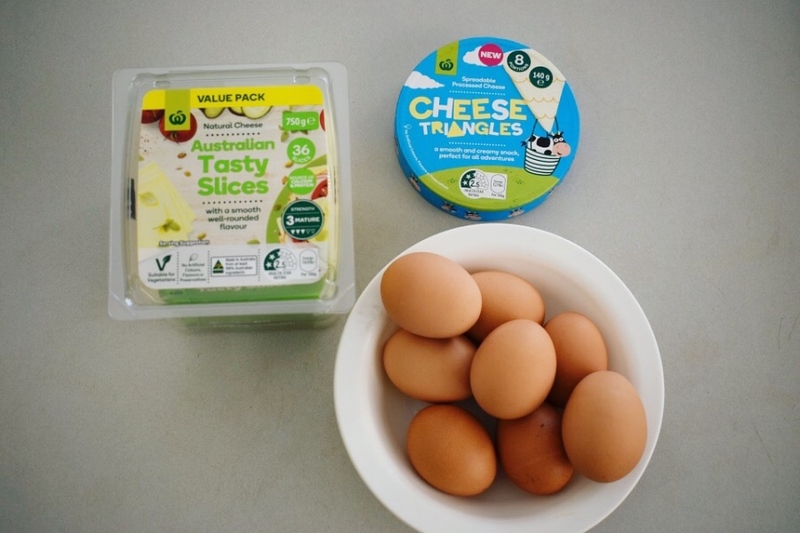 Woolworths follows the Australian Dietary Guidelines which recommend milk, yoghurt and cheese and/or alternatives every day, mostly reduced fat. We do know that most children are not consuming the recommended daily requirement for calcium, so it’s important to encourage the consumption of healthy calcium-rich foods. This can of course include both full fat and low/reduced fat dairy products as part of a healthy balanced diet.